I've been meaning to write this review for a long time. 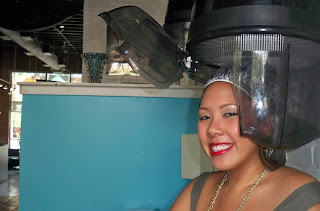 It's not everyday that I review a salon but I definitely want to share with you this find. We actually found it by chance. After spending a Saturday afternoon in Midtown Atlanta to see that Salvador Dali exhibit at our local High Museum, we passed by this little salon. My friend looked it up online and after seeing positive reviews, we decided to give it a chance. When I get my hair done, I always go with my friends Saiesha and Melissa. We always book our appointments together...it gives us girl time as well as some extra opinions on new hair styles. We've been looking for a place that in particular can give us a good blow-out. Our last salon didn't understand how to use a brush and blow dryer to give smooth, voluminous hair without teasing, a flat iron and a bunch of product. At Salon Moree, our hair stylist Yvette showed us how it was done. We all got hair cuts and a blow out. The appointment started with a nice shampoo, leave-in conditioner with a hotel towel over our head and a seat under the dryer. Pretty nice! This process really conditions your hair and renews it for heat styling. I later found that the leave-in conditioner was a bit rich for my hair (I found my hair got oilier quicker in between washes), so I think I'll skip it next time. Yvette cut our hair quickly, and efficiently. She has over 20 years of experience on a variety of hair types. What I really liked is how she was was so quick but the outcome was great. I've had people spend forever and a day on my hair or stylists that are late, talk to much, and make me spend my whole day getting my hair done. I got places to go and people to see! My friends and I all have different hair types: I have straight and thick hair, Sai has waves, and Melissa has a definite curl. I noticed that when she blew out our hair she had a technique for each of us. To make sure my hair held the curl of the blow out, she pin-curled each section after she was finished with it. That way, it held the bounce and body. For Sai, she only needed to pin-curl the top section because her hair already had a wave to it. For Melissa, she actually just twisted her hair with the hair brush after each section so that the curl could hold. Brilliant! We all left with big, bouncy hair that lasted all night. A week later, I went in right before a wedding and wanted to get my color and highlights touched up. At the salon I was in and out within 2 hours. She had also pin-curled my hair for me so that it would last the 5 hours till the wedding. I went for a different look - a darker brown base but I stuck with caramel highlights. At first, I wasn't sure if I liked my highlights because of the color contrast, but after about a week they faded nicely into my base color. If you're looking for a hair stylist in Atlanta I definitely recommend Yvette at Salon Moraee. The prices are around moderate range but totally worth it. I'll definitely be going back. Ciao Bellas! FTC Disclosure: All opinions are my own. I was not paid to write this review and am not affiliated with the company. Services were purchased by me.